In 1987, FEAT was incorporated to train apprentices for Central Florida participating employers. This Industry/Education partnership started with Orange County Public Schools and Seminole State College. As with all effective partnerships, both entities combine their strengths to attain a greater goal. Education provides the instructional expertise to improve training methods, provides classroom space and funding for coordinators and instructors. The Electrical Contractors contribute training materials and supplies. Apprentices work daily in the trade under the guidance of a mentor — a journeyman electrician. It is the journeyman’s job to teach the apprentice the hands-on techniques of the electrician’s job. Many partnerships enhance FEAT’s ability to benefit apprentices and contractors. 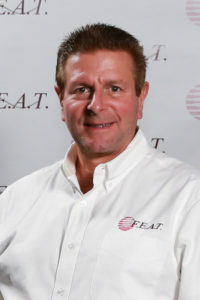 Local chapters of the Electrical Council of Florida, Florida Association of Electrical Contractors and International Association of Electrical Inspectors reward the accomplishments of our theory graduates. Electrical suppliers and manufacturers continually donate training aids to our program. Teachers and coordinators all come from the electrical industry. These dedicated teachers work with the students in the classroom two nights a week, teaching them the theory of electricity and applications of the National Electrical Code. Because they are proud of the work they do as electricians, it is important for teachers to share their knowledge with apprentices to ensure a continuing quality workforce. Many of our current instructors are graduates of the FEAT program. FEAT is overseen by a Board of Directors. The Board is comprised of 8 members representative of the Participating Employers. The Board ensures the well-rounded training and equitable treatment of all apprentices. Due to their daily involvement in the electrical industry, Board members continually identify and implement technological changes to the curriculum. FEAT contractors understand the necessity of training in the electrical industry. They recognize that investing in their workforce enables them to stay competitive in an evolving industry. Contractors were involved in building new apprenticeship facilities at Mid-Florida Tech in Orange County and Seminole Community College. Apprentices and the local economy both benefit from the enhanced training capabilities. FEAT has grown and implemented many changes over the years in response to contractor and apprentice needs. Contractor participation has grown to over 175 participating employers since 1987. We currently have 4 class locations to best serve our students. 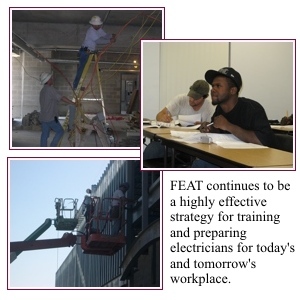 FEAT continues to be a highly effective strategy for training and preparing electricians for today’s and tomorrow’s workplace.